Right from its inception, the NDA government led by PM Narendra Modi has been committed to uprooting corruption. It aims to not only eliminate corruption but institutionalise and nurture honesty. 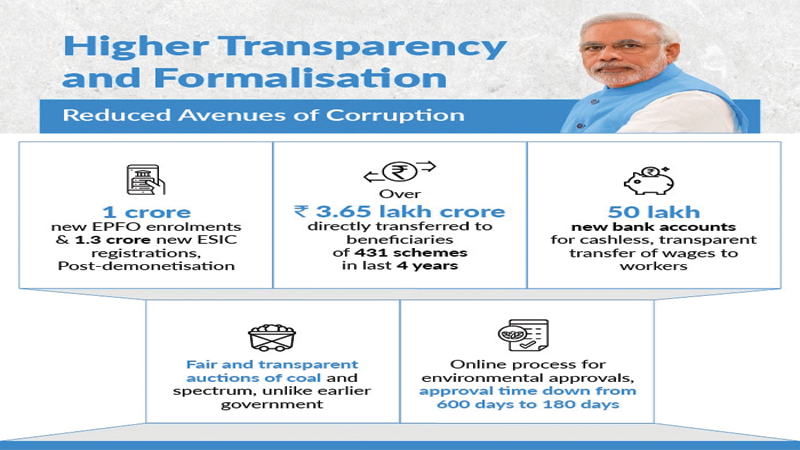 A closer step by step analysis of the various steps taken by the government to make governance transparent, will show the manner in which a transformation has occurred that has not only strengthened the economy from within but also enhanced people’s trust in the government. The multi-pronged approach in fighting the twin evils of corruption and black money has been instrumental in optimising the productivity of the economy while ensuring that the fruits of growth reach the poorest of the poor. From taking legislative action to forming treaties with foreign governments, a wide spectrum of pro-active measures has been taken to make the governance system responsive and accountable. As the first order of business, the government constituted a SIT on black money to look into the sources of generation and accumulation and suggest ways to combat it. A number of the recommendations made by the committee were adopted by the government. One more challenge that the government faced when it took office in 2014 was the coal crisis. The Supreme Court had cancelled the coal block allocations, necessitating a fair and transparent auction process. Without wasting any time, government plunged into action resulting in transparent auctions. This brought a windfall for the nation. A similar procedure was followed for telecom allocation, earning the exchequer significant revenue. In the spectrum auctions too, the government’s approach ensured massive gains, in stark contrast to the zero-loss theory of the past. The long pending Benami property Act was passed to address the problem of generation of black money through benami properties. The Fugitive Economic Offenders Bill was also cleared to equip the investigative agencies going after absconding economic offenders. It allows the law enforcement agencies to confiscate assets of absconding economic offenders and ensures that banks are able to make higher recoveries from loan defaulters. Not to be restricted to domestic countervailing measures, the government has gone a step further in bringing together a coalition of nation to fight the menace. It has amended the Double Tax Avoidance Agreement (DTAA) with Mauritius, Singapore and Cyprus to block rerouting the blackmoney through the tax havens and signed an agreement with Switzerland to share real time information on accounts held by Indian residents in Swiss banks. 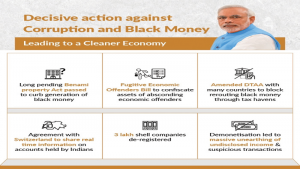 PM Narendra Modi’s government commenced upon a major crackdown on black money ensued with the declaration of demonetisation. The historic move led to massive unearthing of undisclosed income, suspicious transactions and deposits. It further led to action against 3 lakh shell companies that were subsequently de-registered. This move has given a major fillip to a cleaner economy ad formalisation while increasing the tax base. Accompanied with a resolve to end regeneration of black money, a strong start towards a more inclusive economy was made. 50 lakh new bank accounts for the cashless, transparent transfer of wages to workers were opened. Earlier, a big chunk of the government funds disseminated used to get lost in leakages. By linking welfare schemes to the Aadhar card and providing it a legislative framework, the government has made an earnest attempt to plug the leakages in the Public Distribution System and made direct transfer a viable option for disbursement of government funds. Over Rs 3.65 lakh crore has been directly transferred to the bank accounts of beneficiaries of 431 schemes in the last four years. The increasing trust has led to a higher number of taxpayers’ paying their taxes. It is a matter of pride that the number of ITRs filed during FY 2017-2018 are 6.85 crore compared to 3.85 crore in FY 2013-14, thus, helping expand the tax base. Post-demonetisation more than 1 crore new enrolments have been made with the EPFO and 1.3 crore registrations made with the Employees’ State Insurance Corporation (ESIC).Greater transparency and formalisation are ensuring that the hard-working citizens are brought under the safety net, thus, boosting their savings and income security. The Good and Service Tax (GST), the biggest economic reform post-independence has surpassed expectations in its smooth implementation, transparency and compliance. The people of India have wholeheartedly heralded it, which is evident with the fact that the 50 lakh new enterprises got registered within 1 year of GST as compared to 65 lakh in almost 70 years. In an innovative step to ensure transparency, Environment Ministry started process of online submission of applications for Environment approvals, bringing down the approval time from 600 days to 180 days. Further, it made it possible for applications to be tracked online, minimising chances of human intervention to extract bribe for getting project approvals. Similarly,abolishing interviews for on-gazetted posts, has ensured that genuine candidates are selected based on their merit. 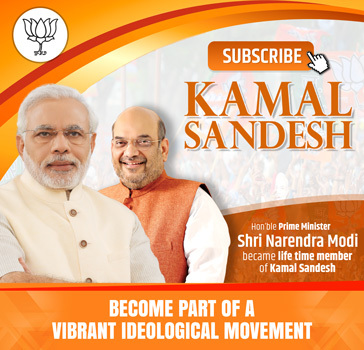 A decisive multi-pronged action has not only laid a solid foundation for economy to grow but has also positively impacted the person at the last mile. A clean, transparent and resilient economy is, therefore, setting grounds for New India to take shape.